Dr. Bak is reader in Psychology at the University of Edinburgh, clinical research fellow in the Centre for Clinical Brain Sciences and Co-Director of Bilingualism Matters. The main focus of his clinical work, research and teaching is the interaction between language and other cognitive functions in the brain. Since 2010 he is the president of the World Federation of Neurology, Research Group on Aphasia, Dementia and Cognitive Disorders (WFN RG ADCD). In this role, he has been working on development and adaptation of cognitive tests into different cultures and languages. 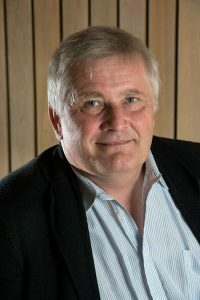 Over the last few years, his work focused on cognitive effects of bilingualism and language learning across the lifespan, in healthy ageing and in stroke and dementia. He has spoken about this topic in press, radio and TV interviews, at Edinburgh Science Festival, Edinburgh Fringe (Cabaret of Dangerous Ideas) and other public events. Dr Bak teaches undergraduate and graduate students in psychology, linguistics, medicine and neuroscience. His main hobbies are travelling and hillwalking, his worst addiction is learning new languages.